This week we invited some friends out for supper to thank them for helping out last October. We set up the Fondue since we haven’t done that in a while and it’s a lot of fun. You can eat while you talk and not stuff yourself like crazy. The challenge was dessert because one of your friends is living gluten free. I have not yet baked gluten free and I probably should do it more often. But this situation presented me with a real challenge since I don’t even have a recipe book for gluten-free baking. Thanks to my wonderful foodie friends I was able to find a lovely recipe. 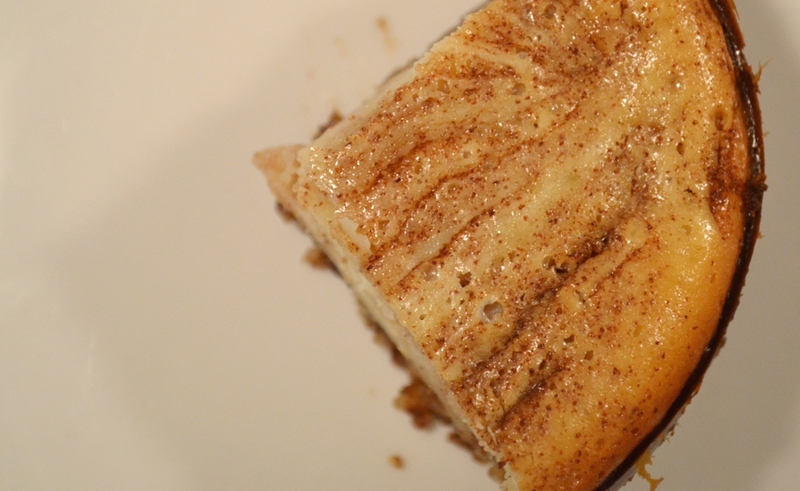 Thanks to the Baking Beauties I got this awesome recipe for what she calls “Gluten-free Cinnamon Bun Cheesecake”. Go check out her site for the original recipe. Here is my mini version. Tip 1: Allow enough time for cooling before serving. 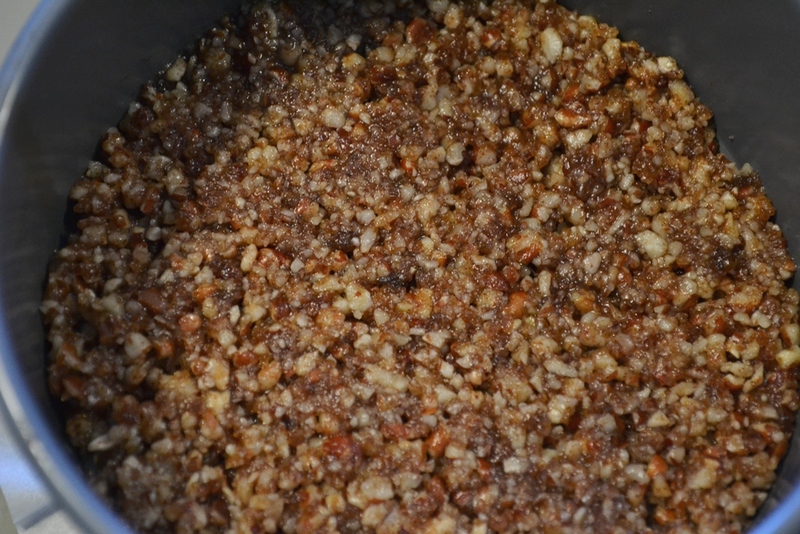 Combine pecans with 1/8 cup of brown sugar and 1/4 tsp. cinnamon in a food processor until in small but not too fine pieces. Then add 2 tbsp. of melted butter and combine again. You should have a slightly wet mixtures which can be pressed into small spring forms (about 5 inches in diameter). Those should be lined on the bottom with parchment paper. Tip 2: I got two small spring forms plus two small tart forms out of the pecan mixture. Beat the cream cheese and granulated sugar until it is smooth. Make sure the cream cheese is room temperature, it will make the mixing easier. Then add the sour cream and cornstarch and combine well. Add the egg and egg yolks one at a time until each is combined before adding a new one. Finally add the salt and 1/2 tsp. vanilla them mix again before pouring into the forms. In a small bowl, combine 1 tsp. cinnamon with the rest of the brown sugar, then add 1/2 tbsp. melted butter as well as 1/2 tbsp. maple syrup and 1 tsp. heavy cream. 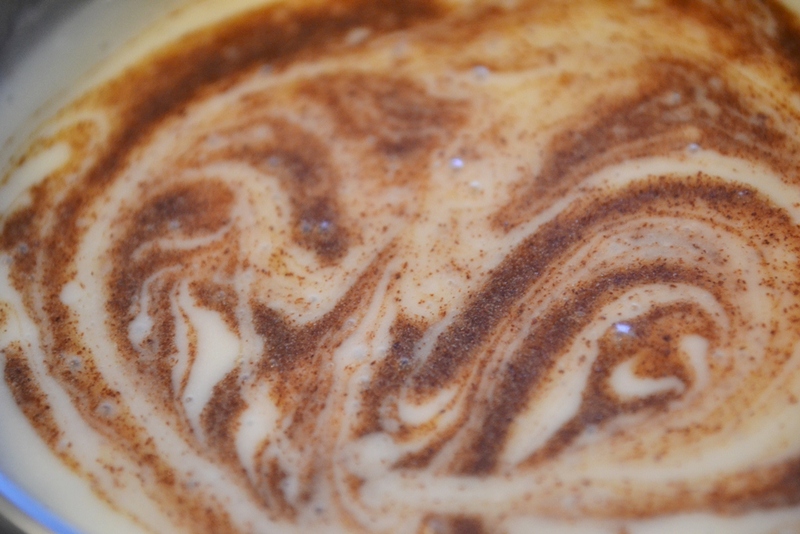 Combine with a wire whisk and swirl it over the cheese cake batter. Using a knife or fork go through the batter to distribute the syrup, making sure not to combine it too much. Place all forms onto a cookie sheet with a rim in case they overflow and bake at 180°C for 40 min. or until set, being light brown. Tip 3: Small tart forms are shallower and thus bake quicker and small spring forms. Check to make sure they do not burn. 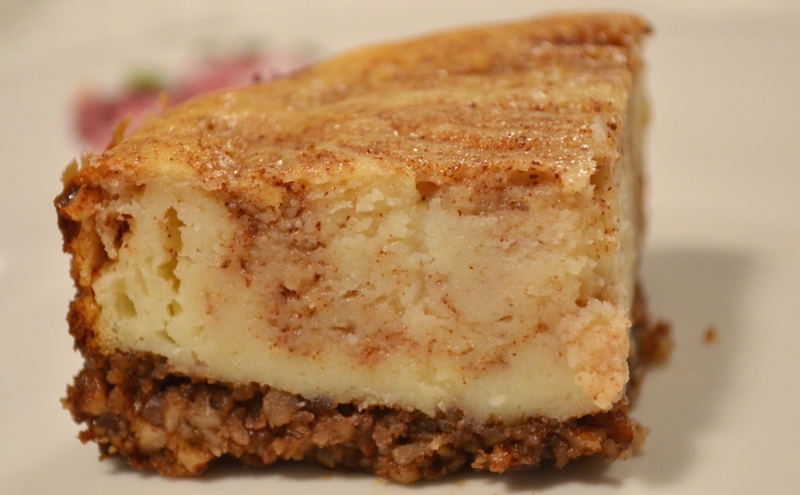 Serve the warm cheese cake with Caramel sauce and chopped pecans or some whipped cream if desired. Posted in Cake, Little Treats and tagged baking, caramel sauce, cheese cake, cinnamon, cream cheese, gluten free, pecans, recipe. Bookmark the permalink. mmm! That cheesecake looks delicious! I’m from Saskatchewan too and people always make fun of me or look confused when I call the last meal of the day ‘supper’. I’ve switched to ‘dinner’ but it’s just not the same to me. I am still working on the “supper”/”dinner” one. It’s difficult to get used to.